Samuel Stutchbury, Geological Surveyor of New South Wales, made the first discovery of copper in the Cadiangullong Valley at Little Cadia in 1851. The Canoblas Mining Company was the first party to mine the copper resources here, commencing work between 1856 and 1859 and continuing to 1861. Little Cadia was excluded from the original lease to the Scottish Australian Mining Company in 1861, but was explored for its potential in 1863-1864, along with the other Cadia properties held by the investors. With the formation of the Cadiangullong Consolidated Copper Mining Company in 1864, mining concentrated at West Cadia, again excluding Little Cadia, which had been found to have limited resources. The mine was reopened for a short time in 1908 as the Cadia Extended Copper Mine, with a water jacket furnace to smelt the ores. No further mining was undertaken and the land was sold in 1918 for £5,000. A number of mining leases were taken up in the 1950s and in 1971, but little work was undertaken. The Little Cadia Copper Mine is located on the banks of a creek in a steep sided and forested valley. 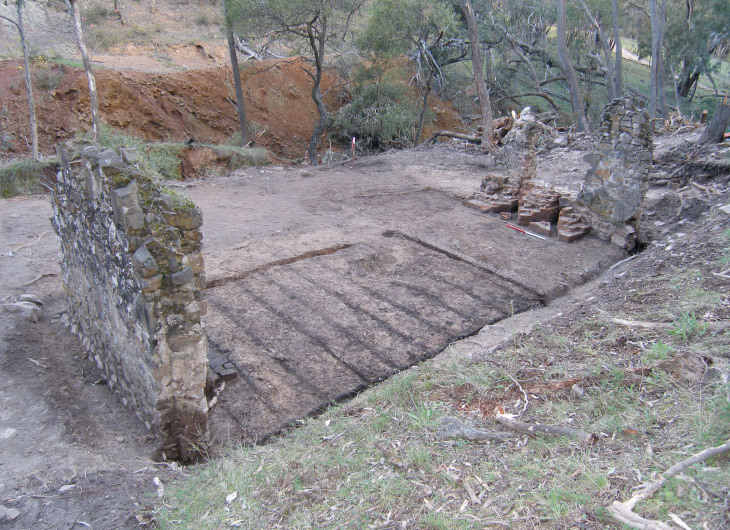 There are several shafts and other workings, dating from the 1850s to 1860s and 1908, the site of the 1908 water jacket furnace, with a small slag heap, together with various creek diversions and dams. Most of the remains are clearly visible and have been recorded, their date and function clearly explained. Two features on the north bank of the creek, the ruins of a building and a separate chimney base defied explanation. They were the subject of archaeological excavation in 2005. 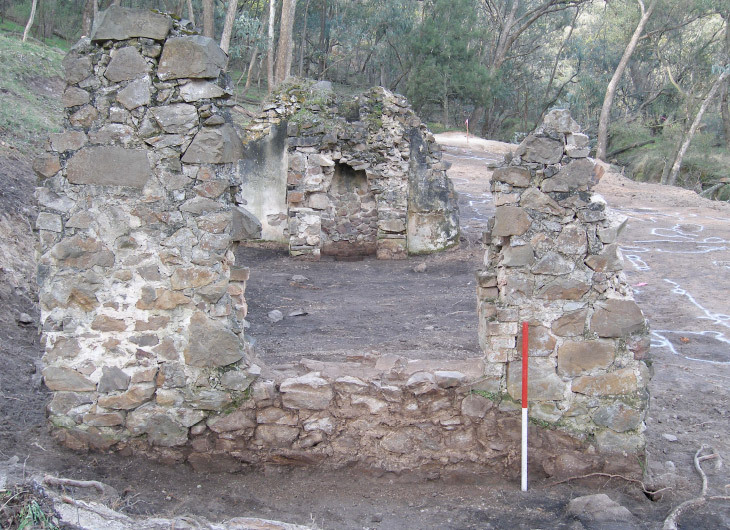 Originally the stone end walls of the building were identified as either a miner’s cottage or more likely an assay office, the historical equivalent of a “Met Lab” or Metallurgical Laboratory. Where possible the topsoil was stripped using a mechanical excavator, but all the intricate work had to be done manually by a small team of trained archaeologists. One of the first surprises was the survival of timber flooring, dating from the 1860s, making the team doubly careful when taking out modern tree roots, so as not to disturb the original footings. 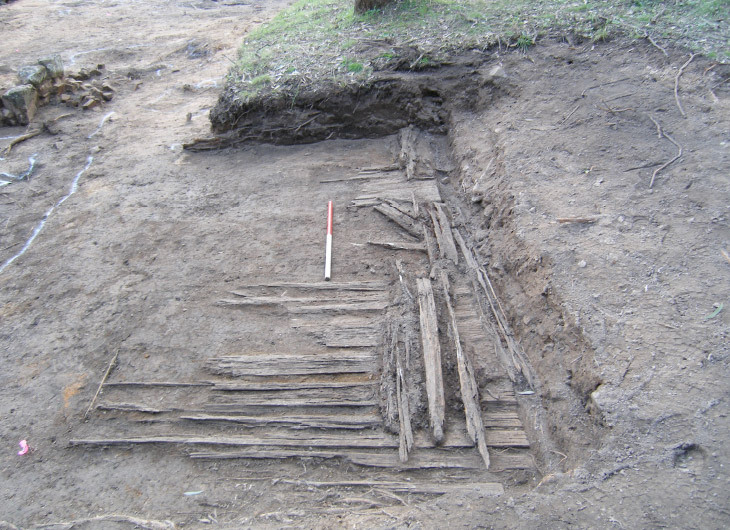 The excavation gradually uncovered the timber floor of a shed, cut into the hillside. The site of this building had not been noticed during previous site survey, because it had been concealed by soil washed down the slope. 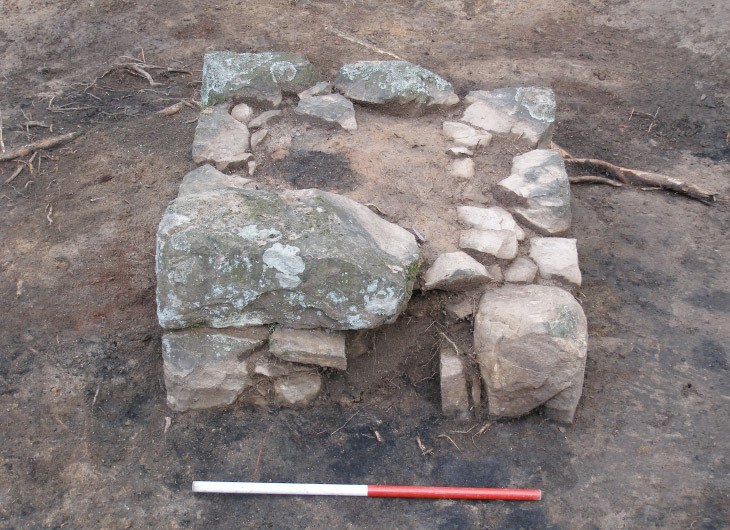 The timber log footings of a building surrounding the stone chimney base were then uncovered, allowing the structure to be identified as a forge. The use of this shed for small scale smelting purposes was confirmed by residues of copper, sulphur and iron among the slag and charcoal covering the floor. The other small timber floored shed may have been a store, since it too had copper and sulphur residues among the timbers of the floor (Area 10). Another forge was cut into the hillside nearer the stone building. 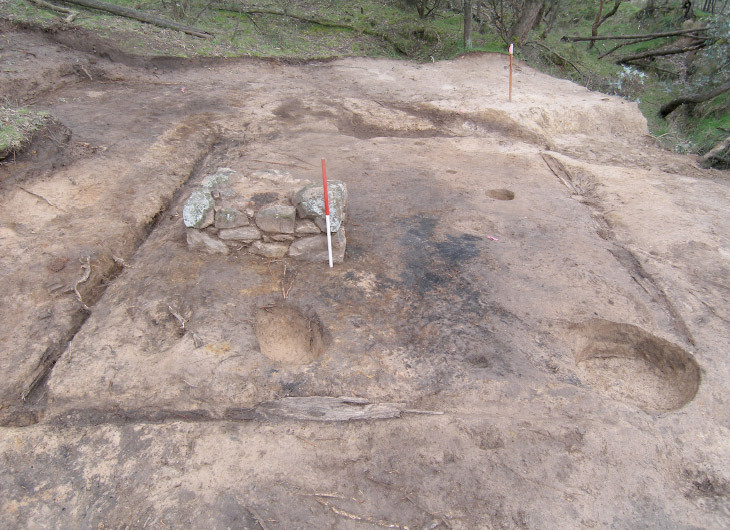 The recovery of slag and charcoal again suggested the use of the fireplace for small scale smelting purposes (Area 20). Finally the team exposed the footings of the building marked by the two surviving stone built end walls (Area 30). Only the end walls of the building were constructed in stonework, the excavation showing that the side walls were constructed in timber. The east end wall was clearly a domestic fireplace, with the plasterwork revealing that shelves had been present on either side of the chimney. This room had a timber board floor, up to a partition wall. Beyond that wall, the second room had a mortar floor. The west wall appeared to have a partly collapsed window or doorway, though the base of the wall was obscured by brick and stone rubble. As the excavation of this overburden proceeded, it soon became apparent that the rubble concealed the brick footings of a well preserved assay furnace, with twin flues. The finding of fragments of Cornish crucibles confirmed the interpretation. The building was now clearly identified as an assay office, with laboratory at one end and office at the other. A small number of artifacts were located at the site, but sufficient only to suggest a workplace. The assay office originally had a verandah along its south side. The excavation had proved not only the presence of the assay office with its assay furnace, but had also revealed the site as a centre for testing the quality of the various ores found at the mine through the use of two other forges or furnaces. Of great interest was the actual shape of the assay furnace and its double flue. A similar furnace had been excavated at Smelter No. 1 at Cadia in 2001. Measurements were checked and their similarities confirmed. Copper Smelter No. 1 was constructed in 1861 by John Penrose Christoe, assisted by Captain John Johns. One argument put forward by the excavation report is that the same smeltermen, who constructed the Cadia Copper Smelter No. 1 also constructed and used the assay furnaces at Little Cadia. If this is the case, then the most likely date for construction is 1863, when the ores at the Cadia properties were being tested. The other alternative is that the assay furnaces were built and used by the Canoblas Copper Mining Company in the late 1850s and early 1860s. The artifact dating suggests that the buildings were used in the 1860s to 1870s, so does not assist in evaluating these two alternatives. 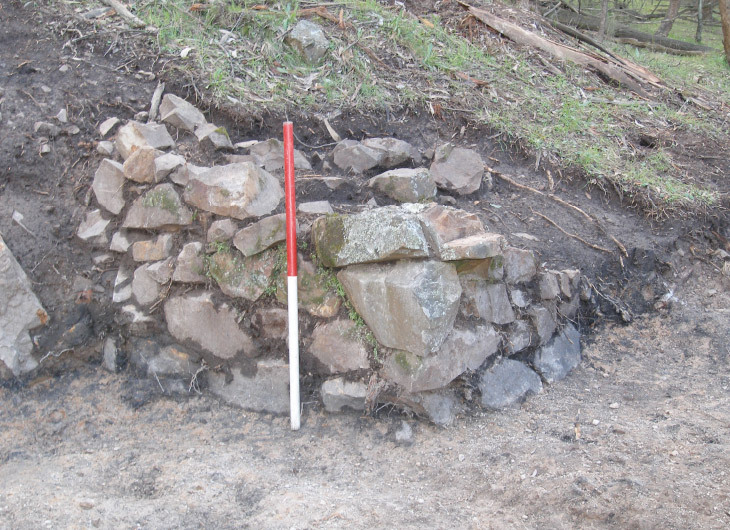 Removal of brick and stone rubble revealed the surviving elements of the building at Little Cadia (scale 1 metre) (Edward Higginbotham). 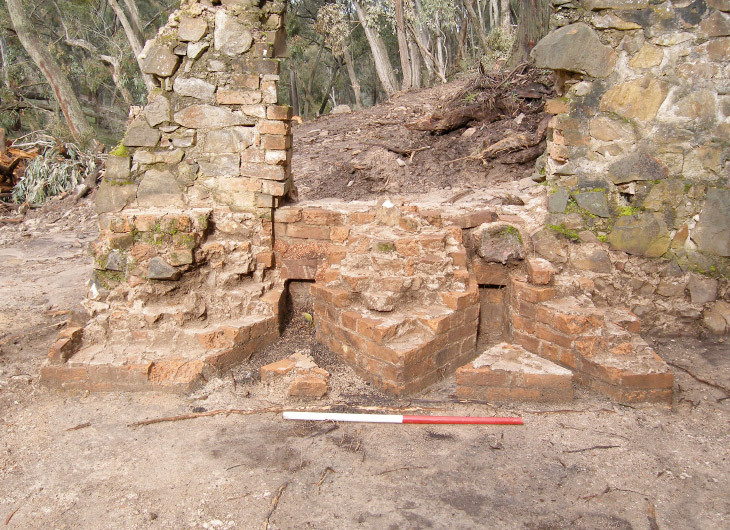 The purpose of the opening in the west end wall of the building was revealed by excavation – an assay furnace with twin flues, constructed in brick (scale 1 metre) (Edward Higginbotham). 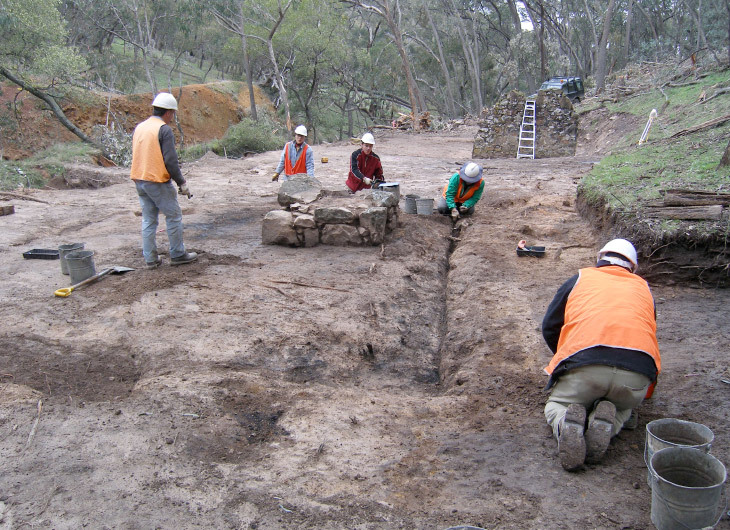 Full excavation of the stone structure expose details of its construction, with timber floor and side walls. There is a mortar floor in front of the furnace (scale 1 metre) (Edward Higginbotham). 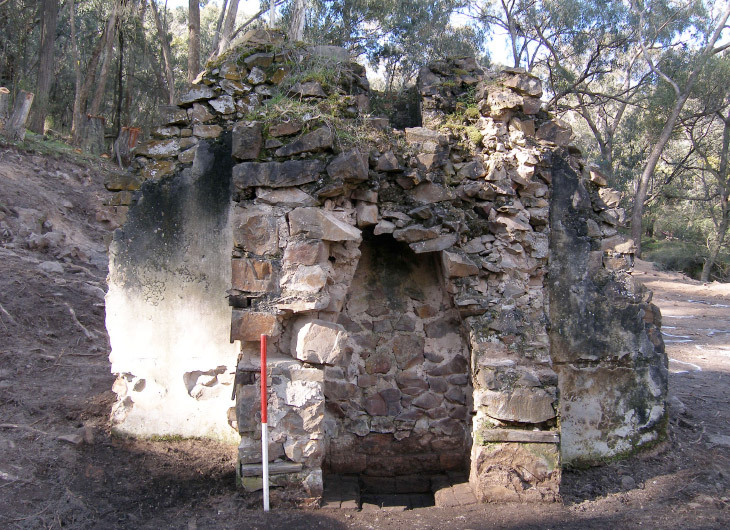 It was the domestic fireplace in the east wall of the building that had originally led the team to interpret the building as a miner’s cottage (scale 1 metre) (Edward Higginbotham). At the opposite end of the archaeological excavations, wall slots with partially surviving timbers revealed the extent of the building that housed the stone forge or furnace. The bellow for the forge may be indicated by the round pit beside the forge (scale 1 metre) (Edward Higginbotham). The burnt deposits on and around the forge reveal the extensive use of the furnace to test copper ores (scale 1 metre) (Edward Higginbotham). A second forge was built into the slope between the assay office and forge building (scale 1 metre) (Edward Higginbotham). One of the most surprising features of the excavation was the survival of timbers, dating from the 1860s. These are the remains of a timber floored shed adjacent to the forge building (scale 1 metre) (Edward Higginbotham). The excavation team uncovers the footings of the forge (Edward Higginbotham).